Johnny Depp finally plays a non-kooky, weird, animated type of character and simply delivers in this role as "Whitey Bulger". He is menacing, terrifying, and captivating whenever he's on the screen. It's probably safe to say that the "Dinner scene" was probably the most intense and suspenseful moment of the movie. Besides Depp, almost every single supporting actor in this film does a really great job of making their characters stand out in their own unique way. Some of the most engaging moments are when the characters don't even speak, and their body language alone speaks volumes. (Signs of great acting.) The film is gritty and the plot is just overall interesting, especially for those who aren't familiar with the story of Whitey Bulger. There are only two things that I think some people may find fault within this movie. 1.) It felt kind of long (2 hours) due to some of the slow pacing of the movie. 2.) Some people just may not like this genre of "Boston gangster" films. 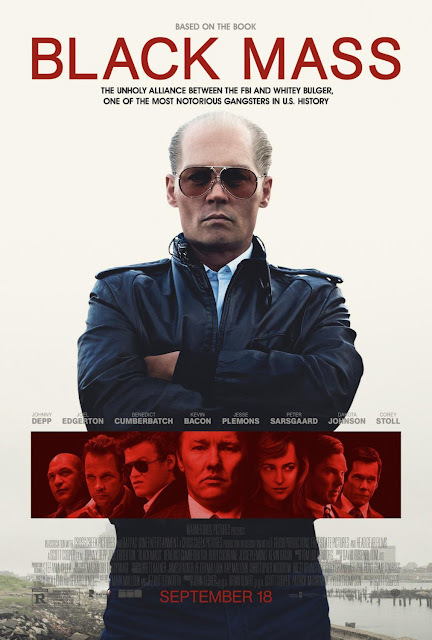 If I had to compare, I'd say Black Mass is like a combination of The Departed + American Hustle. I'd probably say that Black Mass could better be described as "The Departed-Lite". It's a really good movie, filled with a lot of talented actors, who all do a great job overall. I think this could easily be Johnny Depp's long awaited comeback movie, given the fact that (outside of Pirates of the Caribbean) his last great movie was 14 years ago. (Blow). Dare I say, Depp may even get nomination considerations for this role too. Either way, I'd recommend this as worthy of being seen in theaters, especially if you enjoy these mobster type of movies.